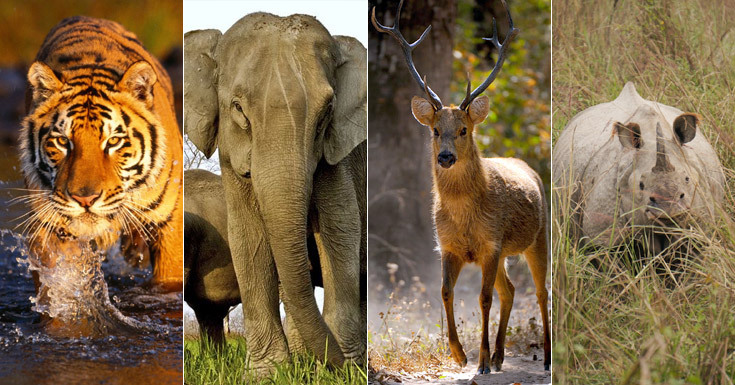 Wildlife in India, this is something the most rewarding experience one can have in his/her lifetime. In terms of area, terrain, landscapes, natural beauty and of course the wild species, India stands first among all the countries in the world. With bountiful of such varied species of floras and faunas; mammals, predators, reptiles and avi faunas in the different sanctuaries and wild reserves, wildlife tours in India is simply impeccable. So, anyone would definitely get magnetized to the thrilling tour to India wildlife. But what is the main motive behind promoting the wildlife tour in India? This is something very exciting question we can have in today’s scenario. Being a tourist, a writer, a travel operator or the wildlife official; every individual should be acknowledged with the significance of India wildlife tourism. There was a time during the monarchic period when the rulers and Maharajas used to enjoy hunting as a matter of interest and kind of showing their braveries. It was believed-the more they hunted the endangered predators, the more powerful they were; and that further continued with illegal poaching of the innocent animals in the current trends. This illegal act is still in its continuation whether more or less in some parts of the country. And with depleting counts of the endangered species, these illegal acts affected the ecological cycle of the environment. Keeping in mind about this serious issue, the Wildlife Authority of India initiated different programs and projects to save the endangered species. Under this program different laws and regulations are being implemented and regulated in favor of wildlife conservation. The major function operated under this regulation was the establishment of different sanctuaries and wild reserves in different parts of the country. As the wild creatures are being reserved under the forest areas only, these reserves and sanctuaries are meant for the protection of the wild species; and the interesting part of it is that the tourist can find a fare chance to catch the mighty glimpses of these majestic creatures. Now, coming back to our question, this is the pretty answer for the significance of wildlife tourism. Yes, we can catch the variety of floras and wild species in the sanctuaries and national parks like the Jim Corbett National Park, Ranthambore National Park, Kaziranga National Park, and more in the different locations of India where the list is simply endless. The wild lovers can surely get closer to the several well-known large mammals including the Asian Elephant, Bengal Tiger, Asiatic Lion, Leopard, Sloth Bear and Indian Rhinoceros at India’s 89 national parks, 13 bio-reserves and 400+ wildlife sanctuaries. These sanctuaries are the happy homes for such wild creatures and the greatest result we have observed in the present days is the fact that people are today much aware of the value of wildlife conservation and have started respecting the wild species around them. Yes, it is true. The different initiatives and conservation programs have really motivated people to respect the wild creatures and the natural environment for maintaining the ecological balance of the environment. This is the reason the India wildlife holidays are better being recognized as ecological tourism. – People are being encouraged to take up forestation and conservation in new areas to maintain symbiosis between the forests, wildlife and the people through different mediums like advertisement, campaigns and different social networking sites. These regulations and actions have really brought great changes in the ecological environment and have improved the counts of the wild species. A positive sign one can definitely find in the reserves and sanctuaries of India to value it and respect it. Come and enjoy the wildlife tourism in India and be the valued part of these majestic creatures for a life time memorable experience.